HomeArchivesCaribbeanU.S. and Dominican Immigration Policies: Is There a Difference? U.S. and Dominican Immigration Policies: Is There a Difference? If we look past the rhetoric, it becomes clear that both countries have the same goal: exploiting foreign workers as source of cheap labor without having to invest in their health and welfare. Texas officials have now found a way to circumvent the long-established understanding that children born in the United States are automatically U.S. citizens. Over the past year some state officials have been refusing to provide copies of Texas-born children’s birth certificates to their undocumented parents. The Texas bureaucrats don’t try to deny that the children are citizens; instead, they simply demand that the parents produce certain types of identification documents—documents which many unauthorized immigrants from Mexico and Central America are unable to obtain. The result is that the kids are being denied their rights as U.S. citizens—including, in some cases, the right to enroll in kindergarten—and may end up stateless. This subterfuge must sound familiar to many Dominicans of Haitian ancestry. The current threat by the Dominican Republic to expel tens of thousands of Dominican-born Haitian descendants evolved over the past decade out of an unofficial practice very much like the one in Texas. While it seems unlikely that the United States will actually try to imitate the Dominican Republic’s policy of “denationalizing” citizens, the actions by Texas officials highlight the similarity between U.S. and Dominican immigration policies. If we look past the rhetoric, it becomes clear that both countries have the same goal: exploiting foreign workers as source of cheap labor without having to invest in their health and welfare. In the Dominican Republic the agency responsible for issuing birth certificates is the national board of elections, the Junta Central Electoral (JCE). In the early 2000s some JCE officials began refusing to provide copies of the certificates to people who couldn’t prove their parents’ legal status. This left many native-born Dominicans without IDs and unable to complete school, find a job, or get married. In 2007 the electoral board made the practice an official policy with its Resolution 12-2007. In 2010 a revised and very conservative Constitution carried the process further by eliminating birthright citizenship for the children of foreigners “residing illegally in the Dominican territory”; previous constitutions had only denied citizenship to the children of foreign diplomats and foreigners “in transit” (in the country for ten days or less, according to a 1939 law). The Constitutional Tribunal, the Dominican equivalent of the U.S. Supreme Court, expanded the denial of citizenship in September 2013. According to the court’s Decision 168-13, “in transit” in the earlier constitutions can apply to any unauthorized immigrant. This in effect revokes the citizenship of Dominicans born to undocumented parents since 1929—as many as 200,000 people, according to some estimates. The Dominican government has a long history of promoting racist outrages against Haitians and their descendants, most notably the 1937 massacre of thousands of Haitians and dark-skinned Dominicans. The targets of the current drive are almost all of Haitian origin, and the U.S. media and many activists have tended to interpret the latest measures as a simple continuation of the old racism. But the new policy also reflects more recent developments. For much of the twentieth century, Haitians came to the Dominican Republic mainly as agricultural laborers, the majority of them working in the sugar plantations—the bateyes. Most of the Haitians were cañeros (cane cutters), male seasonal workers who were kept isolated from the Dominican population—geographically, in the plantations, but also by the anti-Haitian racism encouraged by the government and the media. The Haitian workers were necessary but invisible; the government didn’t even bother to maintain reliable statistics on the size of the immigrant population. All this has changed radically, according to Aran, who studied Haitian immigration patterns while in college. Dominican sugar cultivation began to decline in importance in the late 20th century as U.S. corporations, the main purchasers, switched to corn syrup, with the result that Haitian immigrants have been moving into construction and service industries, often settling down in urban areas. In 2012 the government’s statistics office, the Oficina Nacional de Estadística (ONE), finally conducted its first survey of the immigrant population. The results tend to confirm Aran’s analysis. The survey found 458,233 Haitian immigrants in the country; mostly undocumented, they made up some 4.7 percent of the Dominican population. 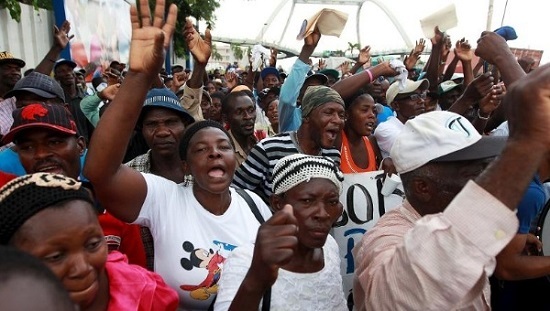 According to an analysis of the ONE survey by the nonprofit Observatorio Político Dominicano (OPD), just 35.7 percent of the employed Haitian immigrants were working in agriculture, while 25.9 percent worked in construction, 16.5 percent in wholesale and retail services, and 10.4 percent in other services. The migrants had also become more likely to raise families. Two-thirds of the Haitian migrants were male in the 2012 survey, but the number of women appeared to have increased substantially since 2002, when the intergovernmental Latin American Social Sciences Institute (known as FLACSO from its initials in Spanish) found that women made up less than a fourth of the migrants. The immigrant population included 38,825 minors under the age of 15, according to the 2012 survey. The researchers apparently didn’t count the Dominican-born children in undocumented families, but nongovernmental organizations estimate that there are 60,000 minors in this category. In other words, the immigrants are becoming an integral part of Dominican urban society, and they and their families increasingly need the same social services as any other urban population. In Aran’s view, the government’s current push against birthright citizenship is basically an effort not to provide these services. The Dominican government’s actions this summer appear to bear this out: despite supposed plans for mass deportations, officials seemed more interested in intimidating immigrants than in removing them. In June immigration officials announced that all undocumented foreigners who had not gained legal status through the government’s “regularization” program would be subject to deportation. Presumably this would include the majority of the Haitian immigrants, along with as many as 135,000 Dominicans who had lost their citizenship—about a half million people all told. But the deportations didn’t start until mid-August, and when they did, the result was hardly the vast ethnic cleansing campaign the government had advertised. The government “repatriated” 220 “foreigners” in the first week, according to an August 20 announcement by Immigration Director General Rubén Paulino Sem. But deportations on this level have been happening sporadically for years. 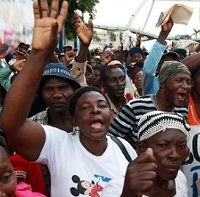 In January 2009, for instance, authorities claimed to have deported 1,120 Haitians in just three days. These deportations bring personal and family tragedies to the deportees and their friends and relatives, but their real importance to the government is the terror created by the threat of deportation. One effect is what conservative politicians in the United States would call “self-deportation.” The government’s June announcement set off a wave of immigrants fleeing for the Haitian border; migration director Sem claimed that 73,606 immigrants had left the country voluntarily as of August 20 (although it’s not clear how Sem obtained such precise numbers). This was probably a one-time phenomenon, however. The more lasting effect will be further intimidation and isolation for immigrants. People living in fear of mass early-morning roundups won’t be demanding social services, roads and sanitation, decent healthcare, or proper schooling for their children, and they’ll inevitably be cut off from much of the society around them—even in urban areas they’ll be in de facto bateyes. If the government’s goal over the past few years has been primarily to withhold social services from Haitian immigrants and their families, the policy seems to be working. As for education, the immigrant population is clearly not a burden on the national budget. The government’s 2012 survey of Haitian immigrants found that only 37 percent of the immigrant children were attending school. Aran’s analysis is probably influenced by his experience with the U.S. immigration system. He is a cofounder of the Laundry Workers Center, a New York-based grassroots organization that focuses on the struggles of low-paid workers from Mexico and Central America; its surprise victory at an Upper East Side bakery-café in 2012 is the subject of a 2014 documentary, The Hand That Feeds. The interview with Aran took place as he attended a protest by workers at a small Manhattan health food restaurant, Pure Food and Wine. A little more than a month after the interview, U.S. presidential candidate Donald Trump announced an immigration plan proposing the elimination of birthright citizenship here. Could the United States really take the Dominican option? Probably not. Ending birthright citizenship would require either a constitutional amendment—a notoriously difficult enterprise in the United States—or a Supreme Court so far to the right that it would be willing to throw out more than two hundred years of legal precedents (excepting the notorious Dred Scott decision). For that matter, Texas officials will probably have to give up their new practice of denying birth certificates. A group of parents filed a suit (Perales Serna v. Texas Department of State Health) challenging the officials in May, and the plaintiffs’ constitutional argument seems airtight. But the United States hasn’t been far behind the Dominican Republic in depriving undocumented immigrants of social services. People without status are already denied welfare payments, unemployment benefits, and all healthcare except what they can get in hospital emergency rooms; they aren’t even allowed to buy health insurance under ObamaCare. And the constant threat of deportation keeps many immigrants—and even U.S. citizens in undocumented families—from demanding the services they are legally entitled to. After all, the U.S. government now deports nearly 400,000 immigrants each year, at a rate of more than 7,000 a week. Allowing for the difference in size between the U.S. and the Dominican populations, our country is actually deporting immigrants at a higher rate than the one that Dominican officials cited in August. The U.S. State Department has refused to condemn the Dominican deportation plan; an August 14 statement merely “urge[d] the Dominican Republic to avoid mass deportations and to conduct any deportations in a transparent manner that fully respects the human rights of deportees.” Some U.S. activists seemed surprised that the Obama government hadn’t taken a stronger stand, but they shouldn’t have been. U.S. officials were probably just trying to keep their options open. David L. Wilson is working on a revised edition of The Politics of Immigration: Questions and Answers (Monthly Review Press, July 2007) with co-author Jane Guskin.